KINGSTON, Jamaica, CMC – Opener Johnson Charles slammed 97 but it was left to West Indies last wicket pair of fast-bowlers Kemar Roach and Tino Best to scramble a thrilling one- wicket victory over India in the second game of the Tri-Nation ODI series at Sabina Park yesterday. Chasing 230 off 50 overs, after India posted 229 for seven off their 50, West Indies struggled to reach the target for the lost of nine wickets, off 47.4 overs. Having steered a pivotal middle-order recovery with left-hander Darren Bravo (55), Charles fell short of what appeared a certain century in the 41st over with an ill-advised aerial drive off paceman Umesh Yadav . With three singles needed to convert a well-composed innings into his third ODI century, Charles needlessly sought another boundary and was the eighth batsman to perish with West Indies needing 19 runs from 10 overs. He was later named man-of-the match for his aggressive and defiant innings , which came off 100 balls and included eight fours and four sixes. 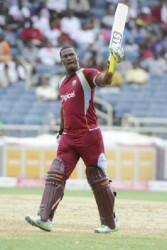 After India took an early grip on the match, dismissing opener Chris Gayle , Devon Smith and Marlon Samuels cheaply and leaving West Indies on 26 for three, young Charles and Bravo pulled around the hometeam with a 116-run fourth-wicket partnership that laid the foundation for the narrow win over the World champions. They came together in the fifth over and resisted the Indians until the 28th with a commanding mix of imperious stroke-play , regular boundaries, and good running between the wickets. However, once the partnership was broken with the score on 142, as Bravo tried an ambitious pull to a shortish ball from Ashwin , the Indians clawed their way back with the wickets of captain Keiron Pollard (4), Denesh Ramdin (4) and Darren Sammy (29). At that stage West Indies slipped from a commanding position to 197 for 7 in the 37th over. Spinner Sunil Narine also went quickly , leaving the last-wicket pair needing 10 runs from 6.4 overs . Best and Roach then saw the team to victory, with Roach hitting the winning run to coincide with his 25th birthday celebrations. Seamer Yadav claimed 3 for 43 from 9.4 overs. India were earlier sent in and opener Rohit Sharma top scored with 60 in the face of good bowling from Kemar Roach, Daren Sammy and Narine. The champions were also given some momentum with 44 off 55 balls by Suresh Raina and later 27 off 35 balls by captain Mahendra Singh-Dohni, who did not take the field because of a leg strain sustained while batting. The Indians were led by Virat Kholi while Denesh Khartik kept wickets in the West Indies innings. Tino Best, Sammy and Roach all picked up two wickets to restrict the Indians and in the end West Indies managed to just reach the modest target. Result: West Indies won by 1 wicket.